The team behind the acclaimed Men's Health: How To Do It are at it again. This time Alan White and David Conrad are putting men's mental health on the agenda. Their new book Promoting Men's Mental Health highlights examples of best practice in the area throughout the UK, Europe and America, and will be essential reading for primary care and mental health professionals, and all those with an interest in men’s mental health. 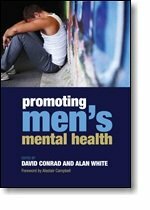 Edited by David Conrad, specialty registrar in public health at Liverpool PCT and MHF chair of trustees Alan White, professor of men’s health at Leeds Metropolitan University, the book also features forewords by Tony Blair's former spokesman Alastair Campbell and the National Clinical Director for Mental Health Louis Appleby. The book recognises how men – in all their diverse groups, settings, lifestyles and stages of life – can face considerable challenges to their mental wellbeing from specific cultural and societal factors, causing difficulties for themselves and those who live and work with them. In addition, these men may respond better to certain approaches and treatment. Promoting Men’s Mental Health outlines the breadth of the challenges and provides guidance for those working in primary care on targeting and helping men who need support. Good mental health is more than the absence of mental illness, and this book therefore highlights methods to promote positive mental health by increasing psychological wellbeing, competency and coping skills, and by creating supportive living and working environments. Alastair Campbell interview on the MHF's malehealth site. Alan White's royalties from this book are donated to the MHF.